The revised 77 Sunset Strip introduction, shot in L.A.’s beautiful, historic Bradbury Building. 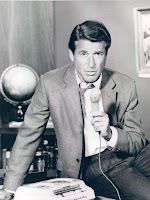 You know, it didn’t really register with me when, more than a week ago now, The HMSS Weblog posted a piece about the sixth and final season of 77 Sunset Strip, the 1958-1964 ABC-TV detective series starring Efrem Zimbalist Jr. I was pretty busy with other commitments, and didn’t have time to think too much about the post. But I dug it out earlier today, and finally read what it had to say. The gist of the piece is that in 1963, as 77 Sunset Strip’s popularity was declining, Dragnet creator Jack Webb and future Cannon star William Conrad were enlisted to give it a new direction and, the network hoped, reinvigorate its audience appeal. As the blog explains, that pair issued everyone but Zimbalist their walking papers, and turned Zimbalist’s Stuart Bailey into “a hard-boiled, lone-wolf private eye worried about paying his rent”--somebody who was actually quite a bit closer to the Stuart Bailey originally introduced by Roy Huggins, the creator of 77 Sunset Strip, in his 1946 novel, The Double Take. (Huggins would later go on to employ similar protagonists in The Outsider, The Rockford Files, and City of Angels.) Also jettisoned in this format change was the “catchy Mack David-Jerry Livingston [theme] song ..., replaced by an instrumental by Bob Thompson.” The revised series apparently moved gumshoe Bailey to offices in downtown Los Angeles’ historic Bradbury Building (where City of Angels’ Jake Axminster and Banyon’s Miles C. Banyon both later welcomed clients). How the series kept its title without actually being set on Sunset Strip is a mystery to me. Maybe someone who’s seen the last season can enlighten us all. “To kick off the new format,” says The HMSS Weblog, “Webb and Conrad began with a five-part episode simply titled ‘5,’ written by Harry Essex and directed by Conrad. The producer-director also made a cameo toward the end of the conclusion. I haven’t yet had a chance to watch all five episodes of “5,” but at least for the time being they can be seen in their entirety here: Part I, Part II, Part III, Part IV, and Part V.
READ MORE: “Great TV Episodes: ‘5’,” by Marty McKee (Johnny LaRue’s Crane Shot); “A TV Series Review by Mike Doran: 77 Sunset Strip, “The Target” (1964) (Mystery*File). Jeez, that all-star cast is unbelievable. Thanks for the tip! Jeff, many thanks. I've been wanting to watch this for years. Starting tonight! Crumbs that takes you back to your teenage years. Loved this series but I don't think we ever saw any of the new one in the UK. Was going to watch them but sadly they've been removed. It certainly was an amazing cast of characters! Winifred: If I were you, I'd try those episode links again.